Crime Watch: A modern-day Sherlock Holmes? 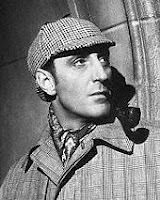 Recently it was announced that filming was underway on a new BBC television series that will turn the iconic character of Sherlock Holmes into a modern-day 2010s-era crime fighter. The Baker Street dwelling detective (he will still live at the famous 221B address) will no longer be making deductions amongst the horse carriages and gas lamps of 1890s London, but on the gritty streets of the modern-day city. The series of 90-minute telemovies is touted by the BBC as "a thrilling, funny, fast-paced take on the crime drama genre set in present day London." For more than 100 years, Sir Arthur Conan Doyle's eccentric drug-taking, violin playing, pipe-smoking sleuth has fascinated readers and viewers around the world. There have been many interesting film and TV adaptations of the stories, including of course the recent Golden Globe-winning performance by Robert Downey Jr as the iconic detective. Other productions, e.g the acclaimed medical drama House, have clearly been inspired by the Holmes character (Hugh Laurie plays Gregory House, an eccentric, highly intelligent, but arrogant and difficult to deal with, flawed individual, who using logic, deduction and reasoning is able to solve medical mysteries). But how do you feel about the characters of Holmes and Watson themselves being brought squarely into the modern world? The new series, Sherlock, is set in the 21st century, and will reportedly have modern events and concerns woven into the stories. The brainchild of Doctor Who writer Steven Moffat and actor and writer Mark Gatiss, star of The League of Gentleman. Holmes will be played by Benedict Cumberbatch (Starter for Ten), pictured left, while Martin Freeman (The Office, Love Actually) will be Dr Watson. Although none of Conan Doyle's original plots will be used (even in adapted form for modern times), Moffat has said that "everything that matters about Holmes and Watson is the same". That will of course, in the end, be for the viewers to decide. Piers Wenger, Head of Drama, BBC Wales, said in a press release that: "Our Sherlock is a dynamic superhero in a modern world, an arrogant, genius sleuth driven by a desire to prove himself cleverer than the perpetrator and the police, everyone in fact." You can read more information about the series here. It has already been sold to other countries like the USA and Australia, and will be broadcast later this year. So what do you think of bringing Sherlock Holmes into the modern world? Is it a sign of the universality and importance of such characters (like what happens with various adaptations of Shakespeare's plays)? Or is the BBC just trying to make money off the name, even though none of Conan Doyle's tales will be used? Thoughts and comments appreciated. Craig - Thanks for this news. I honestly have to say I'm not at all sure how I'll feel about this. I admit to being a purist when it comes to televized fictional characters. So I like Sherlock Holmes as he was originally written. I admit that may give me a narrow-minded view, but unless it's very, very good, I don't see myself looking forward to this one. If "actor and writer Mark Gatiss, star of The League of Gentleman" is involved in the creative end, then I definitely will avoid this version. I saw _The League of Extraordinary Gentlemen" and wrote one of the few completely negative commentaries that I have on my blog. I am cringing. The TV screen writers must have run out of ideas if they've plucked this out of the barrel.